Finally, Spring has arrived, although you might not have known it with the dusting of snow we got last week. Farm news is beginning to get more interesting again as we prepare for the growing season and new life. Over the weekend the boys and I joined Matt for some tree planting. Apple trees this time, the Antonovka variety, which is very disease, pest, and drought resistant. They are considered full size, rather than the dwarf or semi-dwarf variety, and can live 100 years. While we may not see their full maturity in our lifetime, this is an investment for our children. The boys had a blast helping as we planted a few trees on each of the family farms we are related to. They were especially intrigued when we dipped water from the pond for watering the trees and in the buckets we found snails, a minnow, and frog eggs. Afterward, it was time to feed the pigs; which is always entertaining. 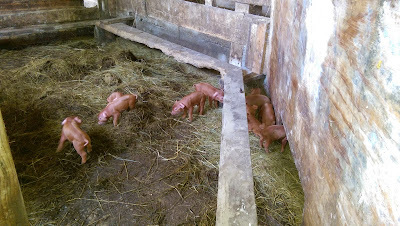 First we got in with the little pigs, but they weren't too interested in us. The squealers and fat butts, both very descriptive of the groups, were next. Then we took some corn to the breeding stock. Molly and Curly are due to farrow in the next month. 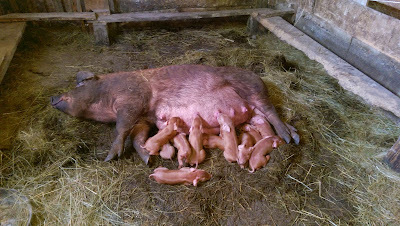 I figured we might as well get a picture of all the mommas that will soon bring new life to the farm. Three mommas due in the next month! Wow. Overdue blog here. It seems that this was my job to write and I've taken my time getting around to doing this. Days, Weeks, Months even. Not years, I'm better than that! Ok. So you are curious about lard. Lard is pretty neat stuff. It's the rendered fat from a hog. And in days past it was used for everything from machine lubrication to candles to soap and cooking. These days we have more suitable oils for lubrication so lard is mostly used for cooking, and some soap. First you need to get yourself some pig fat. You're friendly local pig farmer can help with that! On a pig, there are 2 kinds of fat. The first is Leaf Fat. 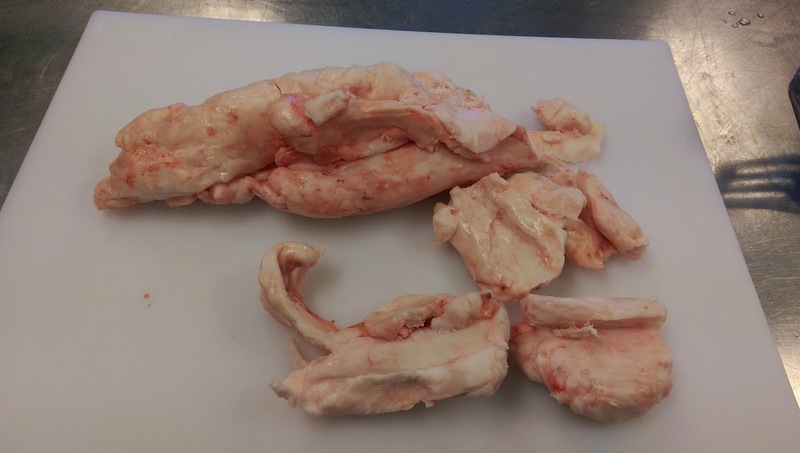 This is the fat that grows internally in hog, in particular around the kidneys. 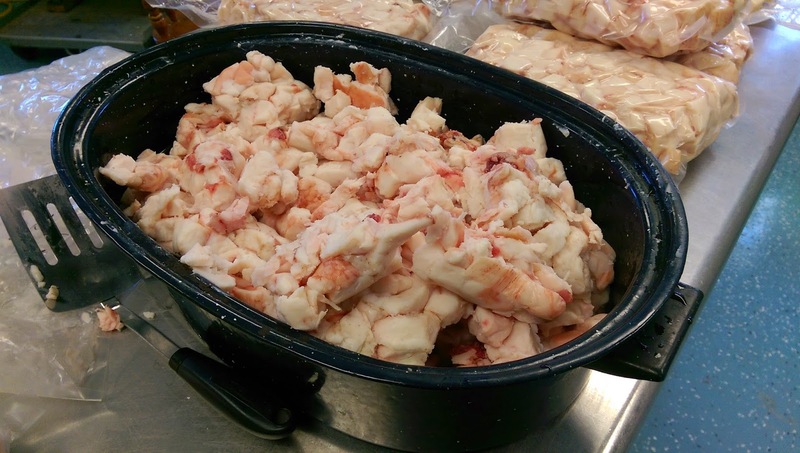 It's smooth in texture typically can be pulled out of the carcass in 1-2 chunks. Ask your processor to save it for you if you aren't processing at home. 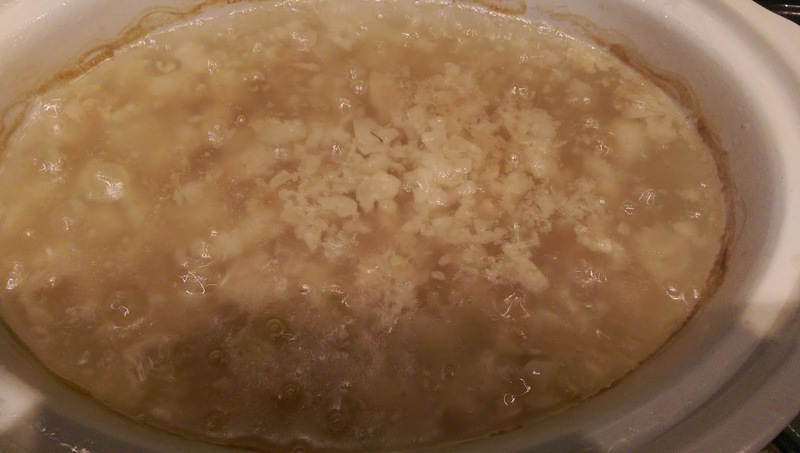 Leaf Fat is rendered into Leaf Lard. This is the cleanest type of lard and can be used in baking and pastries. The other kind of fat on a pig is Back Fat. 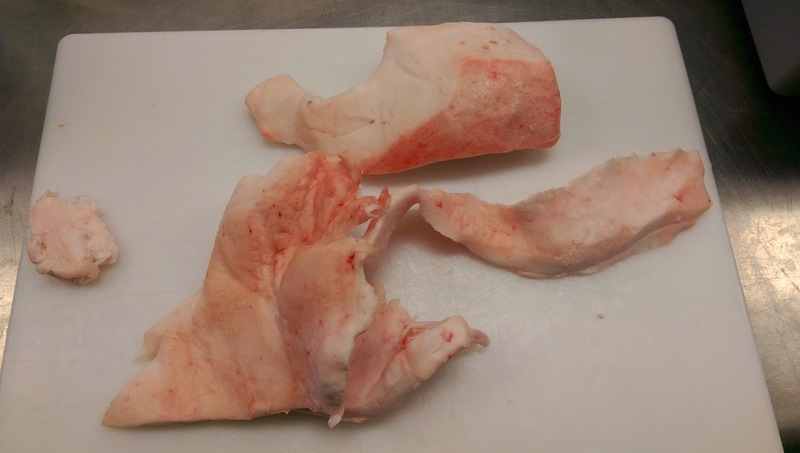 This is the fat that grows outside the body cavity on a hog. It's typically trimmed or removed when cutting port chops or loins. 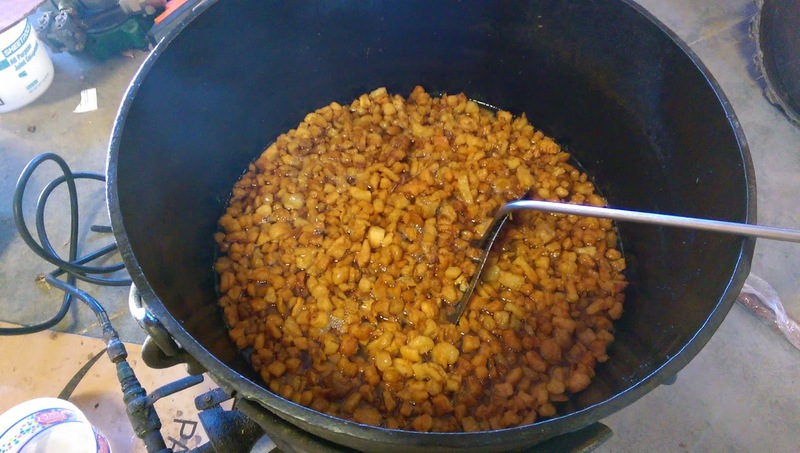 It's often found in chunks as a byproduct of the processing. Processors are glad to save it for you. Back fat is rendered into regular old lard. It's a little more "porky" flavored than Leaf Lard. It's good for frying or soapmaking. You could bake or make icing with it, but you'll have a stronger pork flavor than some may appreciate. To make your lard there are a couple of methods. With all methods the first step is to cut the fat into small chunks. I usually aim for 1" or less. The smaller the better. If you have a grinder you can use that, but since the fat doesn't have much structure in it, most grinders are tedious at best. Once you have your fat cut up, you have a couple options. Option 1 is to use a roasting pan and an oven. Place the cut up chunks in your roasting pan with about 1 cup of water and place into an oven that has been pre-heated to 300 degrees. The water is to prevent bottom scorching early on before the fat melts. It will all be boiled away during the process. Every 1/2 hour or so, open the oven and give the contents of the pan a good stir. When you see the chunks starting to brown you're getting close. When they all sink to the bottom, you're done! At that point you can strain off the lard. I like to use some cheese cloth. Straining is particularly important if you are making leaf lard. 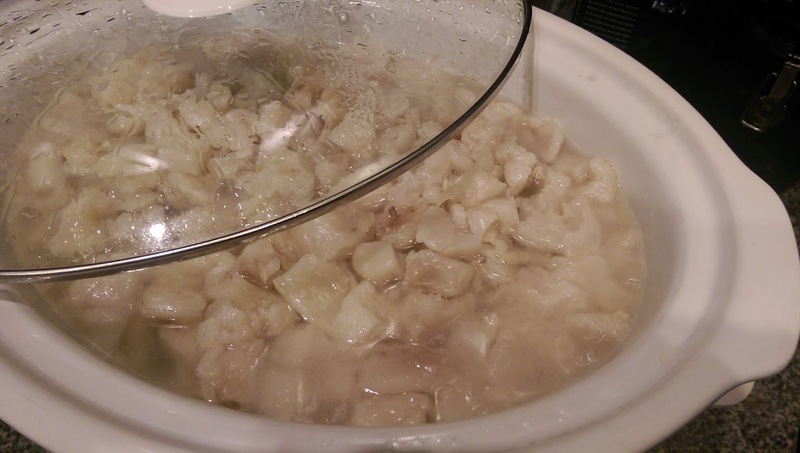 If you have a press, or other squeezing device, yo can squeeze quite a bit of lard out of the chunks left behind. Up to you if you do this. 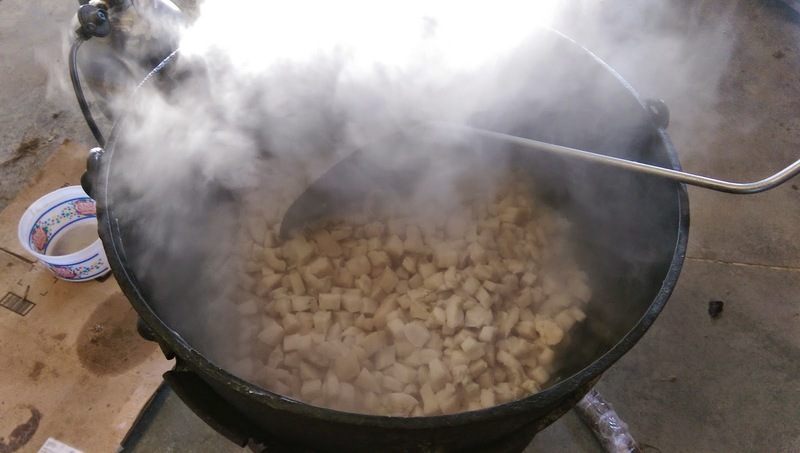 The old timers, would return the chunks left behind to the oven or put them in a skillet. They will continue to fry. 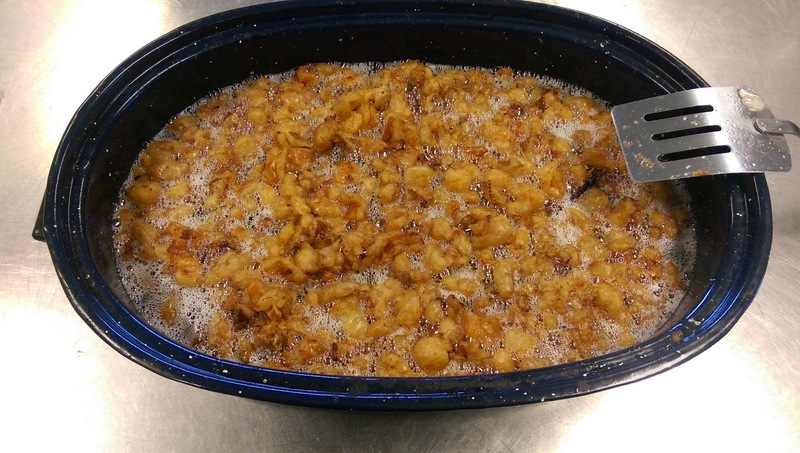 Stir frequently and you'll end up with cracklins. They are tasty, although probably not the most healthy. Next method is to use a crock pot. It's a lot less work that the oven method. But you don't end up with any cracklins and it takes more time. 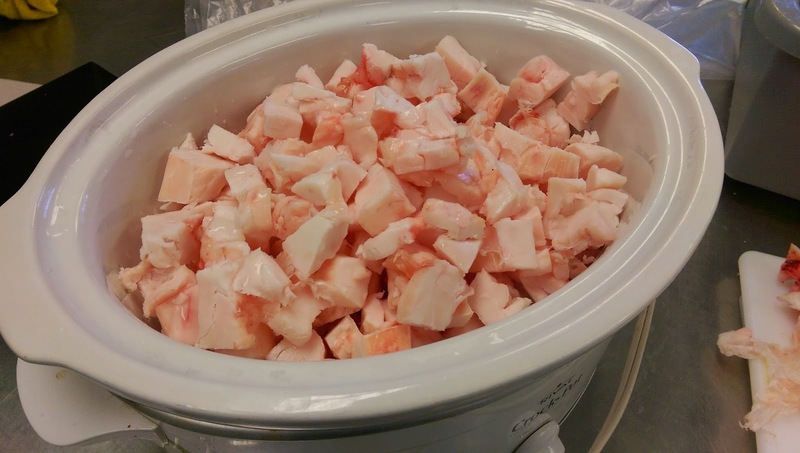 Put your cut fat into the crock pot with 1 cup of water or so to prevent scorching. Turn the crock pot on high and walk away for a while. Every hour or so, give it a stir. After many hours, you'll have something like what you see below. Give it another good stir and get out your instant read thermometer. We need to be sure that we get all of the water out. Since water boils at 212 F, we're looking to see temperatures in the 240-250 range or higher. Higher is ok. Close to 212 and we want to let it go a while longer. Now you can strain off the lard. I like to use some cheese cloth. The material that is left behind from this method doesn't retain much, so not a lot of reason to squeeze or press it. We store our lard in clean mason jars. Keep what you aren't immediately using in the freezer and it will keep for years. Last method is mostly for curiosity sake. Not many people need to render multiple hogs worth of lard at a time. We use a butcher kettle that will hold about 20 gallons of material. It has a propane burner underneath. Using this method you need to have someone stirring constantly as the burner will easily scorch the fat and lard. This leads to a burnt taste. 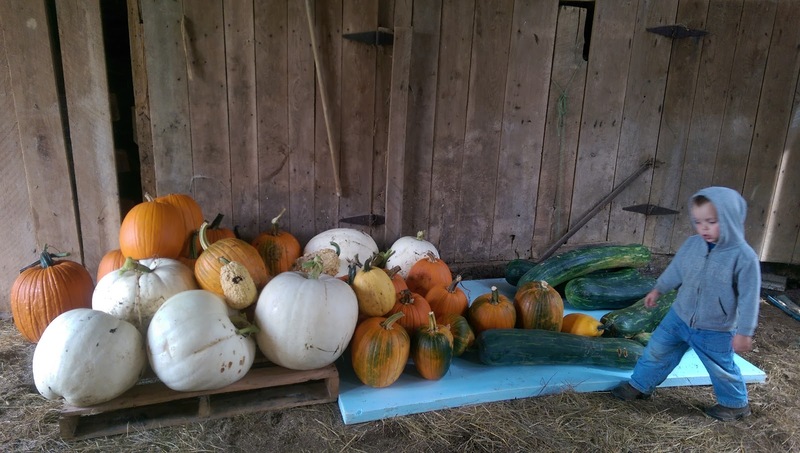 If you have been following us for a while, you may recall last year when we picked up a few truckloads of pumpkins to feed the pigs. This year, we thought, "Why not buy 1,000 pumpkin seeds of many varieties and plant them for pig food?!" So in early June, Jim got the old disc out of the barn and gave the fields hell. In fact so much hell on that very dry ground of early June, that the old disc was worn out and we purchased a "new to us" disc for future use. We ended up planting about 2 acres, all planted by hand. 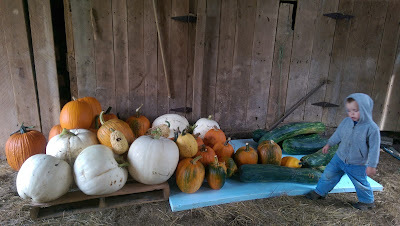 It worked out well with the wet summer we had and the pumpkins grew well. 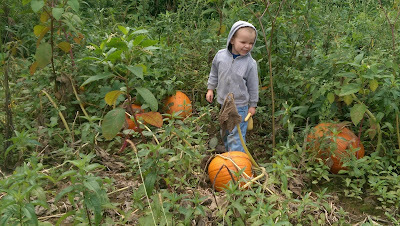 By mid-September, pumpkins were plump and in need of picking before the other wildlife around the farm got too hungry. Little boys had fun picking the little ones, and the those that were as big as they could handle. 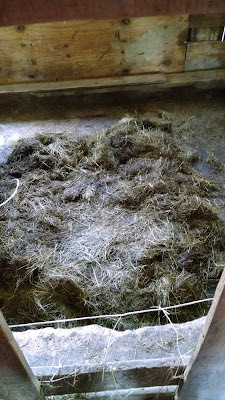 We stacked some of them in the barn for storage, but it would seem the rodents loved the taste of them too. Now, a couple months later, little boys still enjoy the excitement of the tasty pumpkins as their daddy or poppa launches one in the air at just the right trajectory for a big explosion of guts when it lands; perfect for little pigs to dig in and devour. Then tell me why it has been so long since there was a blog post? I'll get back to that, but first a funny story to share about Bacon going MIA yesterday. I got a call from Matt around 4:30 yesterday as little boys were waking from naps. Bacon loves to eat and he always enthusiastically shows up, but when Jim called him, he didn't show. With an unsettling feeling that we were going to find a dead pig, Matt left work early, but needed me to bring clothes for him since he only had nice work clothes. 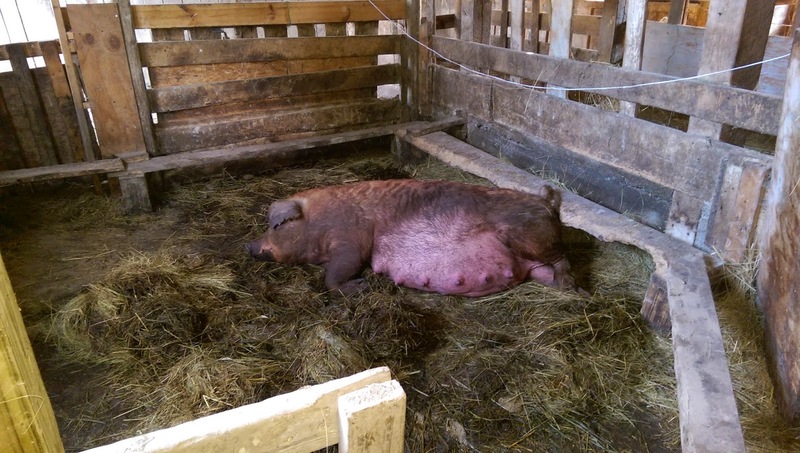 We were all a little concerned since 11 months ago we lost our first boar, Crybaby, and Bacon was his replacement. It would be awful to lose two young boars less than a year apart and you can't breed sows without a boar. Thankfully, just before I was leaving we got a call back. Karen, Matt's mom, had gone down to the barn to see what was going on and there was Bacon, standing in with little pigs, pushing them out of the way to eat their food. Jim had fed them first before he had gone on to feed the breeding stock. So how did this pig get out, you ask? Well... that would be a farmer error as it turns out. 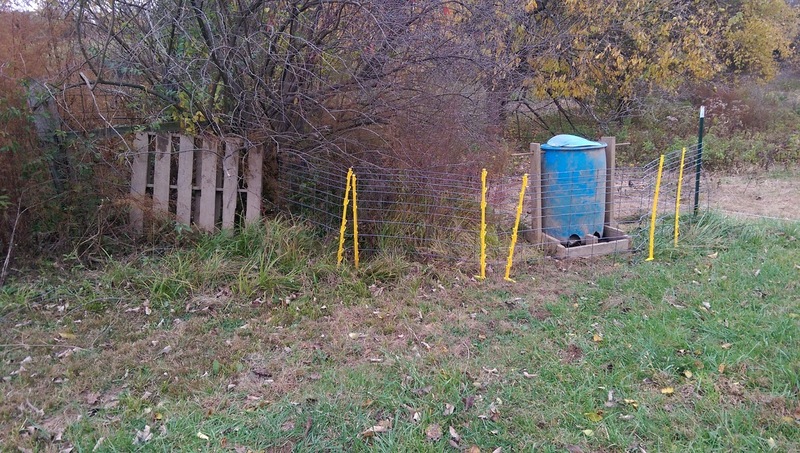 When they moved pigs last weekend they left a small gap in the fence and he just walked right out. 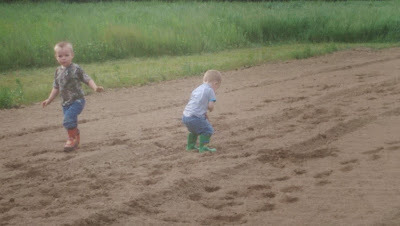 (and by small gap, I mean 10 feet) Always lessons to learn on the farm. The un-fenced spot. I can see why it was easily overlooked. A quick fix until it could be properly patched today. Okay, so I'm sure you're wondering why it's been almost 4 months since I had a blog post. I had several drafts started along the way, and plenty of ideas, but life got crazy. For starters, I had a bad case of pneumonia back in July that lasted several weeks. Shortly thereafter, my 95 year old grandfather passed away and there were lots of family things going on in conjunction. In mid-August, we also committed to starting some homeschooling with our oldest, Will. 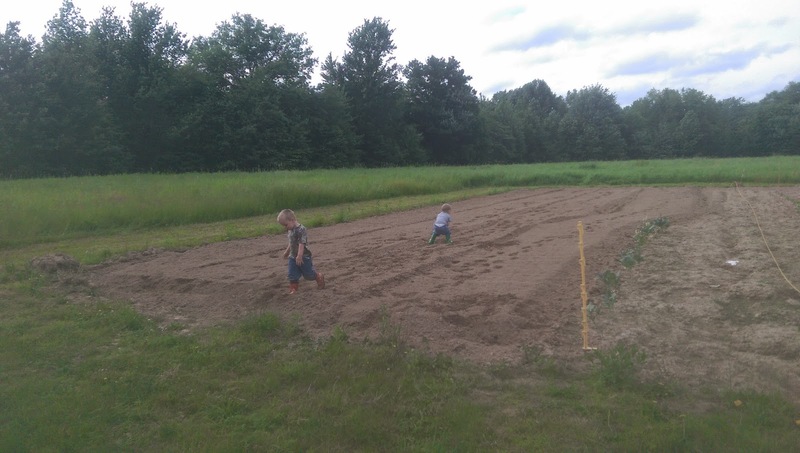 It has been so worth the time commitment for this enthusiastic little learner that begs to do school at home, but the time I spend prepping and schooling has cut into the time I used to spend doing farm-related paperwork and blogging. The boys had fun at the State Fair. Our tractors aren't that big. Much has happened since our last post in early July. I hope to bring you up to speed over my next few posts. Of the remarkable news, our family received the Indiana Homestead award for the hundredth anniversary of the farm in the same family. New sign on the farm. 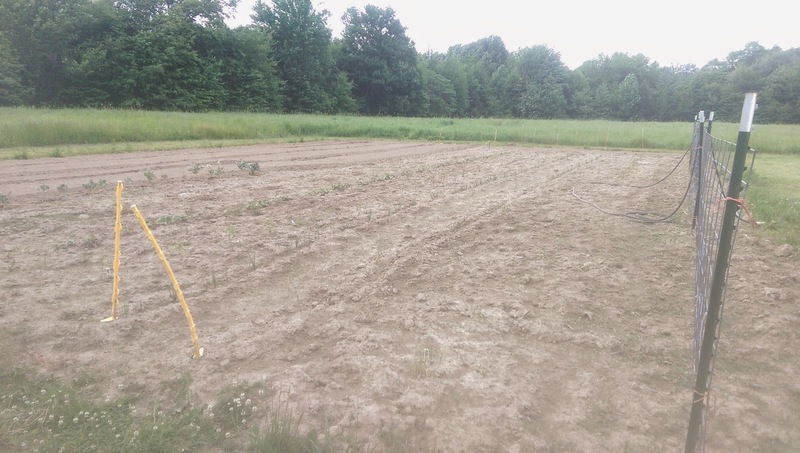 Also, early October marked the second anniversary of Fork Right Farm in operation. Lastly, and probably most exciting news that contributes to my lack of posting is the fact that we are going to need another set of mud boots on the farm next year. We're adding another pair of mud boots to the family! Happy Halloween from Fork Right Farm! The farm is such a wonderful place for kids to create lifetime memories. 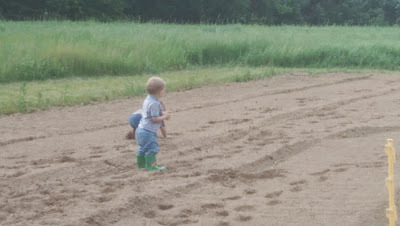 When I think back to my childhood, I remember climbing in the hay or walking on the feed corn still on the cob in the corn crib, and lots of time spent playing in the creek. 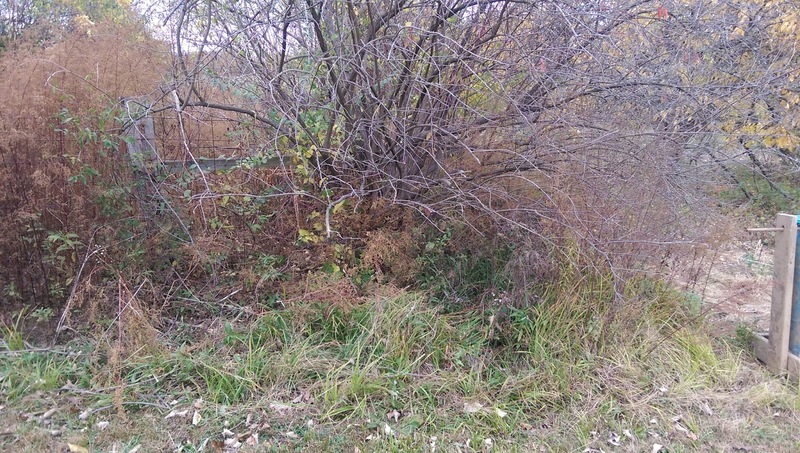 For Matt, it is memories of checking the fence with Pap or fishing at the pond with Grandma. I feel so blessed that our boys are already getting to make those memories, not just at one farm, but on three different farms if you include the one we live on, the one my mom lives on, and the one where Matt's parents live and he grew up. Or this photo where the walked round and round and round again on the tire with the pole sticking up. These were a perfect volleyball net pole or tether ball pole, but also very fun to walk on and wobble. I think the best memories of all are the endless walks and nature hikes just seeing what our beautiful world has to offer. We are fortunate to share this farm journey with the boys and show them a different side of farm life where pigs eat grass, run in paddocks, and build mud holes the size of a Volkswagen. Back in May, it was time to plant our garden. Thankfully, little boys were willing to participate so we could accomplish the task at hand. 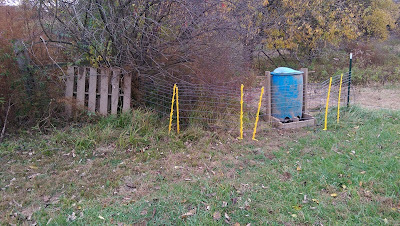 We opted to move the garden this year to "the other side" which we hope will drain better than the side we usually use. So I sent Matt to the greenhouse to buy plants. We usually buy our tomatoes and peppers, but plant our beans, cucumbers, melons, beets, spinach, squash, and zucchini from seed. We also purchased 4 varieties of onion sets. 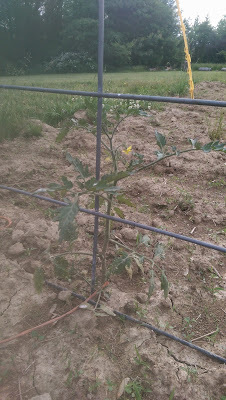 He came home with 28 tomato plants and 32 pepper plants, various varieties. 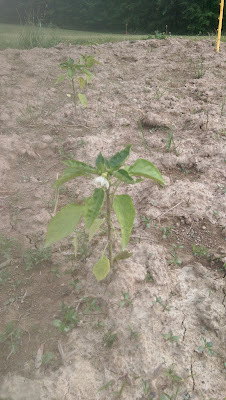 I got to plant the tomatoes and pepper while he planted seeds. Little boys were enthusiastic about helping. 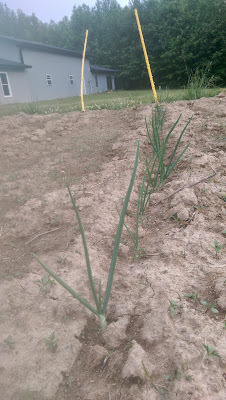 Actually, so enthusiastic that we had onions planted twice as close as they should be and there was stomping that nearly missed the tomatoes and peppers I had just placed. Matt usually runs a rope from post to post at either end of the garden in an effort to plant a straight row. Not sure that happened with Keegan pulling on and climbing over the rope as as he made the row. For a short period of time the boys entertained themselves. There was great joy in stomping across the freshly tilled earth and leaving tracks, just like the deer do if you are unlucky. But the most memorable part was when Will laid down in the dirt and began to make angels in the dirt as if it was snow. He was so exited and proud of his work. I love the innocence of a child and how concepts fit together just perfect in their minds. 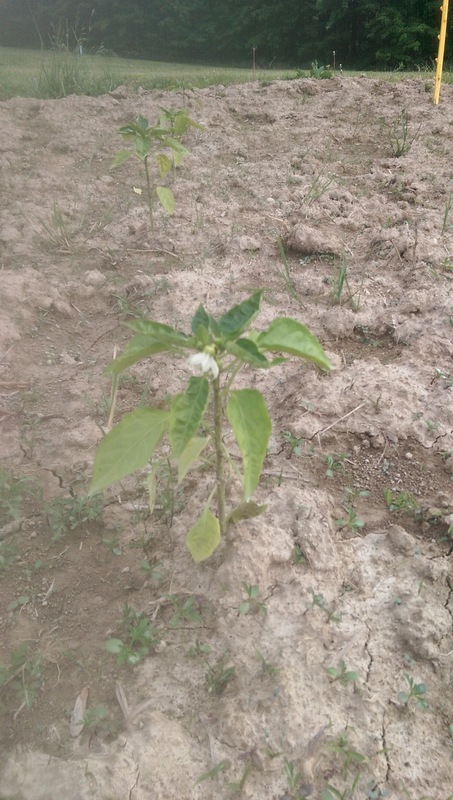 In the last month, our garden has flourished and the seeds turned to healthy plants. The weeds flourished too. We'll see about posting an update when those are under better control and a picture would be more presentable. Okay, so it wasn't my intent to write a second part, but we received some interest and since we have photos of nest building, we decided to share this way rather than just random photos. 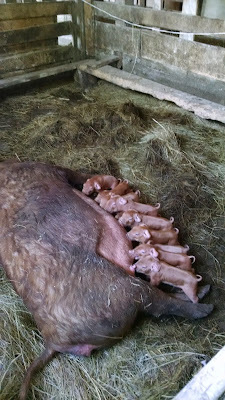 As we expected after our Wednesday night post, Molly had her babies on Thursday. The first real sign that Molly was about to farrow is that her teats were leaking milk, but she was still eating, which meant she wasn't ready yet. 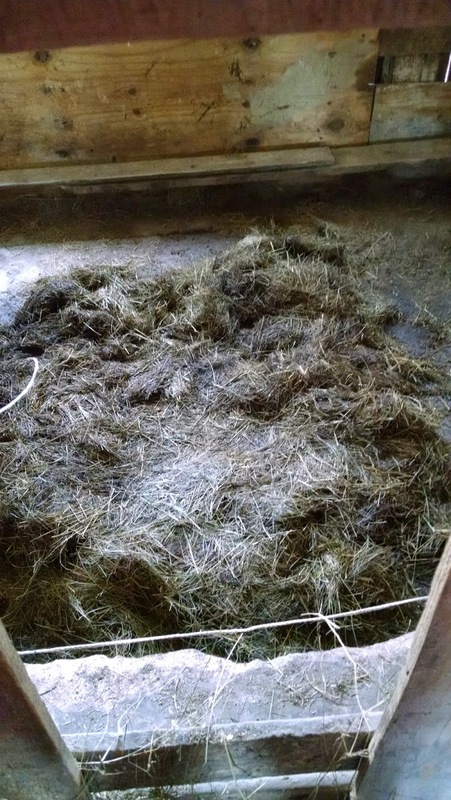 Then, the next day she rearranged her bedding to build a nest. This is very common for unconfined pigs to do (not something you would see those limited to a farrowing crate capable of doing at this extent--remember, happy pigs...) Had these mamas had access outside of their paddock surrounding the barn, who knows what they may have collected from the field or woods to add to their nest, but this inspires ideas for the future. Molly is a great mama and had a big litter. Her babies couldn't have lined up better in this photo! The first 48 hours are critical and when we are most likely to see any mortality. While this may surprise you, it isn't unusual. Some babies just aren't as strong as the rest. We really try to let nature take it's course and not intervene. The strongest survive and that is what carries the herd into the future.